IP-HE950 Encoder/Decoder comes with auto sensing function. Housed in small 1U half rack size chassis, IP-HE950 Encoder/Decoder supports SD, HD and 4K video resolutions. Featuring robust network error correction, dual encoding capabilities and variable I/O interface, unit uses H.265/HEVC technology. Product offer low latency ooperation and reliable IP transfer. At the upcoming NAB Show in Las Vegas, FOR-A will introduce the latest product in Fujitsu’s line of video transmission solutions, the IP-HE950 real-time H.265/HEVC encoder/decoder units. Employing the latest compression tools and image processing algorithms to provide best-in-class video fidelity, the IP-HE950 supports real-time 4K contribution, as well as SD and HD. FOR-A is a distributor of Fujitsu’s high-performance encoders and decoders in North America, Europe, Middle-East and Africa, as well as select regions in Latin America. The IP-HE950 encoder/decoder units will be shown FOR-A’s NAB booth, #C5117. The IP-HE950 will be shown in FOR-A’s IP/12G-SDI booth area. The Fujitsu IP series of video encoders and decoders use advanced technology encoding to perform real-time transmission of HDTV at low bit rates over DVB-ASI and broadband IP networks. The IP-HE950 utilizes new H.265/HEVC technology, which can provide a two times compression ratio over H.264/AVC technology. The IP-HE950 comes in a small 1U half rack size chassis, with front panel and keys for easy operation. Offering low-latency operation and high reliable IP transfer, the unit supports a wide range of video resolutions – including SD, HD and 4K. The IP-HE950’s video format auto sensing function will adjust compression video formats automatically. Users can elect to install the Fujitsu unit as an HD model first, then upgrade to 4K later with simple field upgradable software, making it a future-proof investment. 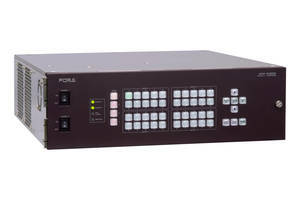 The IP-HE950 features robust network error correction, dual encoding capabilities, and a variable I/O interface, and offers standard support for a wide range of input-output interfaces. Two Ethernet ports come as standard with the IP-HE950. Fujitsu’s IP-HE950 is one of over 15 new products that FOR-A will introduce in its NAB Show booth. Included in the extensive product line-up will be new production switchers, multi-viewers, routers, high-speed cameras, 3D graphic systems, and IP/SDI converters and transport gateways. The company is focused on comprehensive product integration, and as part of its full HD and 4K initiative, continuing with the construction of a comprehensive IP and 12G-SDI infrastructure.